Real Fun...in the Real Florida! Check out the amazing flyover video through the park by Alan Nyiri on our home page! 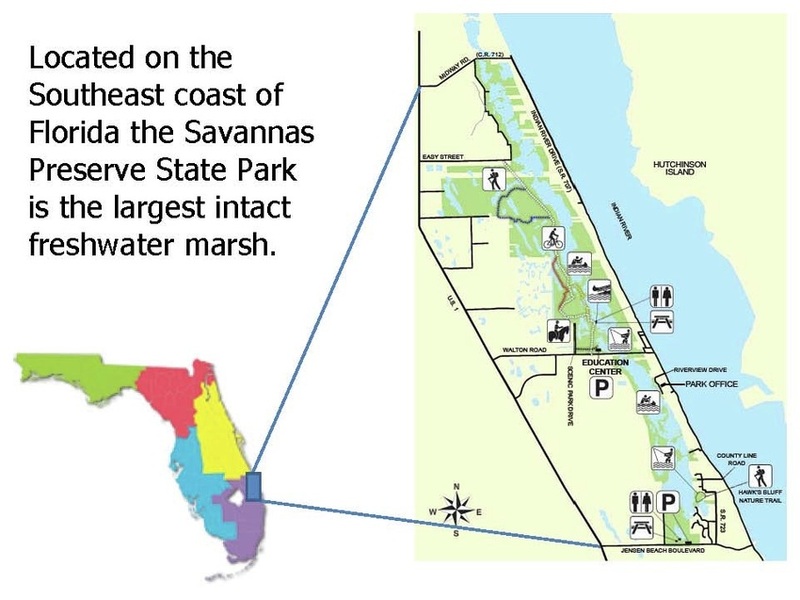 Encompassing more than 6,800 acres and stretching more than 10 miles from Ft. Pierce to Jensen Beach, Savannas Preserve State Park contains the largest, most ecologically intact stretch of freshwater marsh in southeast Florida. The park offers visitors a variety of ways to explore and learn about this natural area. Begin by visiting the Education Center located off Walton Road. The award-winning facility features interactive exhibits and displays on local history, the preserve's natural communities, plant and animal species and how the Florida Park Service is managing the park for future generations to enjoy. The center also features live animal exhibits. Numerous interpretive activities are available to school groups and park visitors, including guided walks, and kayak/canoe trips. There is also a small picnic pavilion and environmentally-friendly restroom. To reserve a tour, please call the Education Center at 772-398-2779. From the Walton Road entrance, hikers, bicyclists, and horseback riders share more than 15 miles of multi-use trails. An equestrian area, located off nearby Scenic Park Drive, can easily accommodate trailers with plenty of space to unload horses. Equestrian users will need to call the Education Center for the gate code. The trailhead on Jensen Beach Boulevard is now connected with trails north of Walton Road via the White trail, allowing visitors to traverse from Jensen Beach to Fort Pierce. Call for trail conditions as trails may be submerged during parts of the year. Also located at the Jensen Beach entrance is a short Blue Spur Trail, a picnic pavilion, and restrooms. From U.S. 1 head east on Jensen Beach Boulevard toward Indian River Drive and turn left on Savannah Road to access the Hawk's Bluff Trail. The State Park sign on the left indicates the sandy pull-off parking area. The Hawk's Bluff Trail leads to Lake Eden where migratory and resident birds can be viewed. In Fort Pierce, the Miller Property on the St. Lucie River Preserve on the Miller property on Lewis Street off Edwards Road offers three multi-use hiking, bicycling, and equestrian trails ranging from 0.15 miles to 1.26 miles. The red trail parallels the North Fork of the St. Lucie River where fishing and kayaking/canoeing are allowed. The newest part of the park is the Evans Creek Canoe/Kayak launch area that accommodates handicapped paddlers on a tributary of the North Fork of the St. Lucie River. The paved access road is on the west side of U.S. 1 between SE Village Green Drive and Walton Road. This site also has a picnic table. Gopher Tortoises have been seen crossing the access road. Check out the video of a handicapped kayaker using the launch site. Camping is not permitted at this park.